Fresh water filtration system for cleaning and using canal and river water. European standard, fully automatic water treatment plant for the return of black and grey water to the rivers or canals. Blue board for starboard passing. 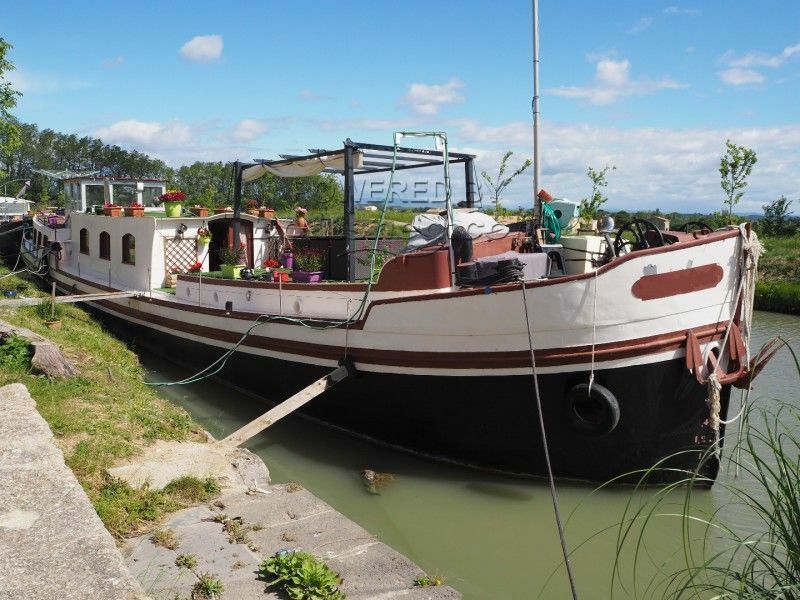 This liveaboard Luxemotor style dutch barge is moored on the Canal du Midi in a popular town close to the Mediterranean. Boatshed Midi Canal is happy to offer this Dutch Luxemotor for sale in the Midi. She is a well fitted out and fully equipped for living on board throughout the year and could be easily used a b&b with few alterations. Two large deck terraces ready for dining and sunbathing. Twin rails for driving car/motorbikes to stern platform. For more information or viewing, please contact Graham WHARMBY, your local broker at Boatshed Midi Canals. This Luxemotor Dutch Barge Live Aboard has been personally photographed and viewed by James Hebden of Boatshed Midi Canals. Click here for contact details.